During my pre-mission research I realised that the chance of meeting a sturgeon in the delta was close to zero. Unfortunately. So I took the chance to dive with the sturgeons at the Danube Delta Eco-Tourism Museum Centre in Tulcea before setting out in the delta. They have a special sturgeon aquarium including the largest and most sought-after species of them all, the great beluga. Entering in full scuba gear into a tank with a good number of sturgeons was interesting and new to me. And I guess new to the sturgeons as well. I could instantly sense that the two leaders, the biggest beluga and a pale Russian sturgeon, was a bit grumpy to have an underwater photographer without a written invitation in their aquarium. It took me some 20 minutes until the big beluga stopped challenging me with close swim-bys. Then another 10 minutes until the pale Russian sturgeon had tasted my black neoprene hood two times with it’s long and tube-like mouth. After two “love bites” the two emperors of the tank thought I was pretty much OK and I had a really great day with four different species of the Danube sturgeons (starry sturgeon, Russian sturgeon, sterlet and the big beluga). Ever since the dinosaurs the sturgeons have inhabited our world but today their story is going from bad to worse. Most of them are on the verge of extinction and are listed as critically endangered (IUCN). It was not long ago that giant Belugas, almost the length of a small bus, migrated up the Danube as far as Germany. An amazing species which can reach a staggering six meters or more in length, and weigh one and a half tonnes. 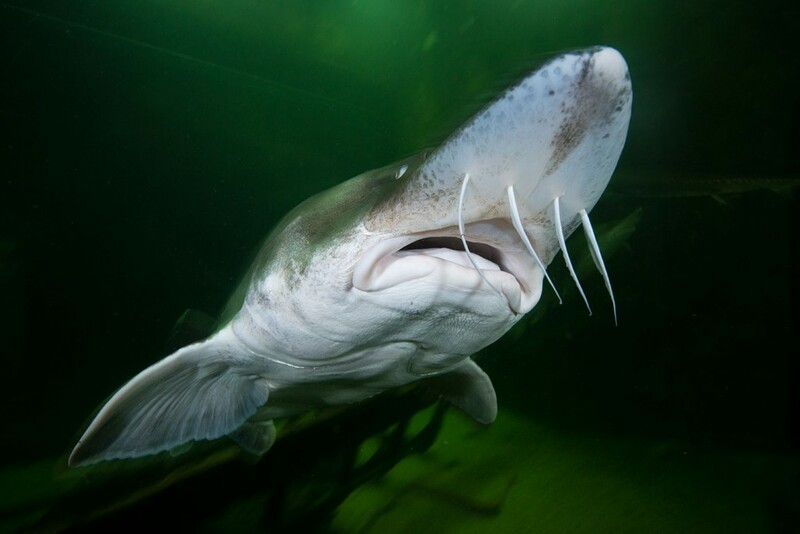 The sturgeons live supposedly to about a 100 years of age and mature very late, at 10 to 20 years, which makes them very vulnerable to overfishing. Most sturgeons are anadromous, which means that they spawn upstream and then feed in river deltas and estuaries. The Danube sturgeons used to travel from the Black Sea as far up as Vienna and even further, covering distances of about 2 000 kilometres. Today these migrations are impossible due to dams that now block the spawning migration routes in the Iron Gate Gorge at the border between Romania and Serbia. The day after the aquarium adventure Cristian drove me to a place outside Horia village, not far from Tulcea, to photograph a sturgeon farm in operation and young sturgeons. We wanted to see something that is a part of helping the sturgeons back to healthy numbers. The farm is basically like a hatching farm, raising sturgeons until they are big enough to be reintroduced into the wild with a high survival rate. 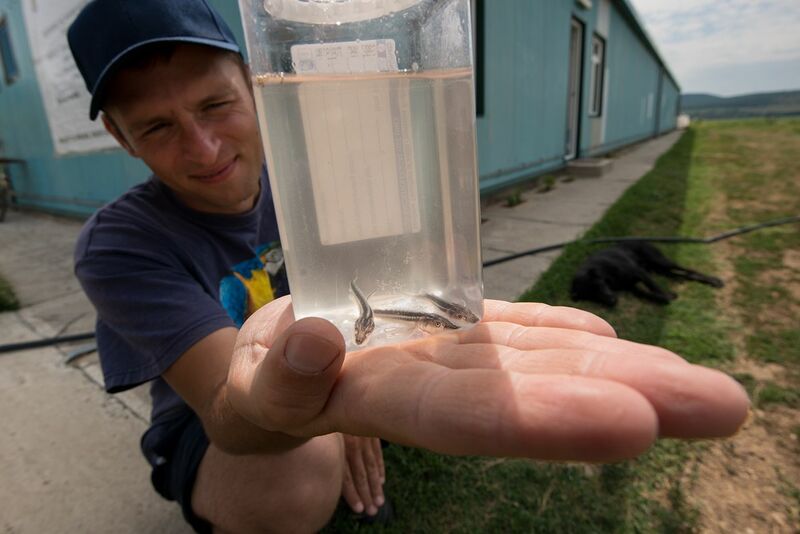 Some sturgeon species are now highly dependent on breeding in hatcheries. 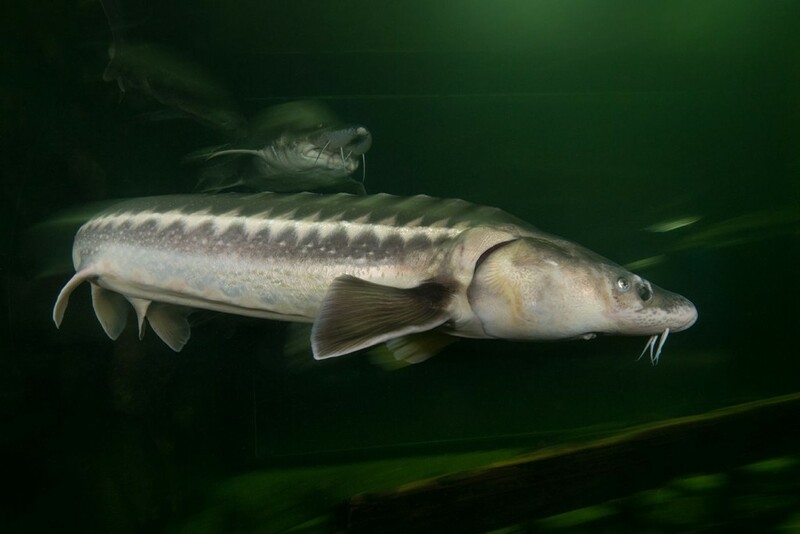 A reliable source states that around 90% of the recruitment to the beluga sturgeon population depends on artificial breeding. Of all the present threats to the sturgeon (like destruction of migration routes, the draining of feeding and spawning grounds, river pollution, etc) the biggest problem by far seems to be overfishing. The sturgeon caviar, or “black pearls”, is an unparalleled food delicacy today mainly exported from Iran, Russia and Kazakhstan and the trade is very profitable often viewed as “gold-mining” compared to regular fishing. The other side of this problem is the consumption where Switzerland, France and Germany are the largest importers of caviar. Since there is a lot of money involved it is believed that a significant part of the trade (10 to 12 times) is hidden from statistics and the domestic markets for example in Romania are even more blurred. Illegal harvest and trade in sturgeon caviar and meat is today associated with worldwide corruption. Romania, and later Bulgaria, has officially banned sturgeon fishing until 2015, but the enforcement is inefficient. Legislation and enforcement are very clear and important signals and tools but we need to rub the facts into the face of the buyers at the same time. So even if it tastes really good, or if some just want show off their wealth, we need to make it clear that it really is very “uncool” and unwise to eat caviar these days. Anyone who eats sturgeon caviar today is an active part of the extinction of the sturgeon species.